Latin Patriarchate of Jerusalem stayed in the Gulf State during the visit of Pope Francis. This is the first time in history that a pope has visited the Arab Peninsula, the birthplace of Islam. Archbishop Pizzaballa continued, “We cannot expect this visit to bring a concrete solution. Only general statements can be made. However, the meeting itself is momentous because it gathers together religious leaders in a region that is the cradle of the monotheistic religions, but also one that is shaken by religious conflict. A meeting between the Pope and the Grand Imam is thus an important sign.” According to Archbishop Pizzaballa, the Christian-Islamic dialogue has entered a new phase. “There is a before and after ISIS,” the Italian Franciscan said. “The Islamic-Christian dialogue began a long time ago. But it was very formal and general. With the appearance of ISIS, the dialogue became more concrete and more realistic. 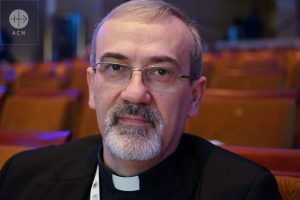 For all involved, it is about stopping aberrant behaviour as well as killing and massacre in the name of religion.” As religions in the Near and Middle East also have a political and social dimension, the archbishop continued, the issue has now become how to develop positive relationships with each other in everyday life. 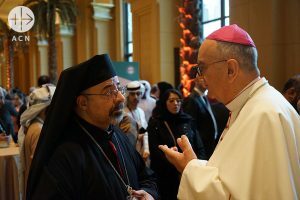 Patriarch Ibrahim Isaac Sidrak, head of the Coptic Catholic Church and Bishop Camillo Ballin, Apostolic Vicar of North Arabia, discuss during the intereligous conference of Abu Dhabi. The Pope’s next trip to a Muslim country will take place on March 30 and 31 when François visits Morocco. This year marks the 800th anniversary of St. Francis of Assisi’s visit to the Grand Sultan of Egypt and the Pope’s travels are a way of celebrating this anniversary. TAGS: Abu Dhabi, Aid to the Church in Need, Interreligious dialogue, Pope Francis.